SOLD Exceptional color for iolite! Very well cut and polished, rich deep blue purple color, eye clean. Looks like a fine tanzanite. PDT3 3.63cts 9.7 x 7.8mm radiant cut China SOLD Super calibrated cutting, very bright gem, great transparency, choice rich lime green color. 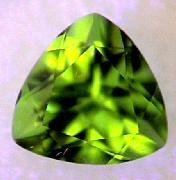 Super calibrated cutting, very bright gem, great transparency, bright lime green color. Super calibrated cutting, very bright gem, great transparency, bright lime green color, minor crystal inclusions. 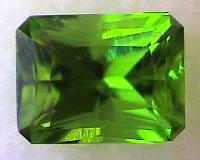 Super calibrated cutting, very bright gem, great transparency, bright lime green color, slight inclusion in one stone.